The Youth and Junior hockey seasons began over the last several weeks and I got the chance to see a few of the teams play that I help coach. I was reminded of a saying that I love that I read in a book on marathon training. This saying is also my son Caden’s all-time favorite and I use it with him a lot. So I began thinking about this and how it pertains to the approaching hockey season. It is clear to me that this saying applies to both coaching AND playing. A bite is a way to ingest nutrients. Nutrients are essential for growth and change. Over the years I have learned that the team you begin the season with is never the one you finish it with…ever. The hockey season is really just a big elephant. Each week is just one bite of the season…one bite of learning…one bite of practicing…one bite of nourishment…one bite for the opportunity to grow. It is a long way from August to March. There are many bites to take and a thousand chances to grow and develop. It is important to enjoy each and every bite even if some bites taste better than others! Now some advice. Don’t be too worried or excited about your team right now. You will have a chance for many more bites along the way whether you are a player or a coach. Actually you have a full meal and then some. If you take your bites properly, chew slowly and do things correctly you will have the chance at the most delicious dessert…one where your team and you have both grown and improved. Wholesome, nutritious bites are just weeks of great practices and preparation. So how do you tackle a season that lasts eight months? 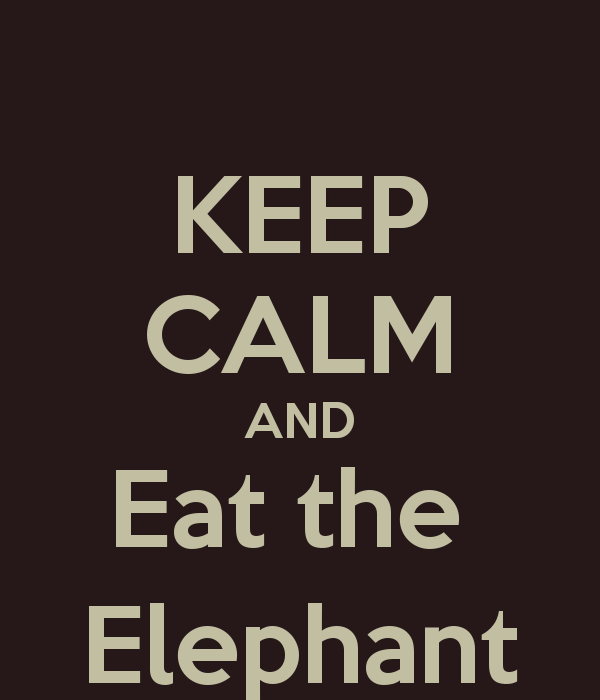 The same way you eat an elephant…one bite at a time. Just remember to make your bites count. Posted in Uncategorized on September 16, 2015 by thehockeysummitblog.